The Marshall County Senior Citizens Center is a haven for anyone who is seeking new friends and a healthy senior lifestyle. Founded over 50 years ago in Marshall County by the late Lena Mae Pickens, the program has been a viable part of community life since its inception. Continuing in it's rich tradition the center is free to all adults 55 years old and older. 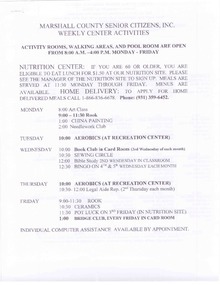 The Senior Citizen Center also houses the Nutrition Center and Home Delivered Lunches program. The Senior Citizens receives funding from the state of Tennessee and the federal government. These funds are administered by the South Central Development District based in Mt. Pleasant, Tennessee. The Senior Citizens Center also receives funding from Marshall County government, United Way, private donations, and fundraisers. The Nutrition Center provides cafeteria-style lunches at noon, Monday through Friday. A senior must come by the Nutrition Site and complete and application to take part in the Nutrition Site meals. For more information call 359-6452. To apply for Home Delivered Lunches, call 1-866-836-6678.